Subject: Rear Disk Brakes Conversion For Datsun 240Z. Attachment = Drawing of adaptor plate. Carl my name is Mike Wisdom I have a 240 that I race only and have come up with a rear disk brake setup, that is very easy to bolt on. I fabricated a mounting plate from 1/8 steel and would be happy to e-mail this drawing so anyone interested in this setup can see what the adapter plate looks like. It uses an 82 -83 Z rear rotor and front calipers from a 87-90 Sentra. This is a direct bolt on. You will need to change to an in-car proportioning valve though. The main problem is getting good pads, I am having Carbotech make me set. 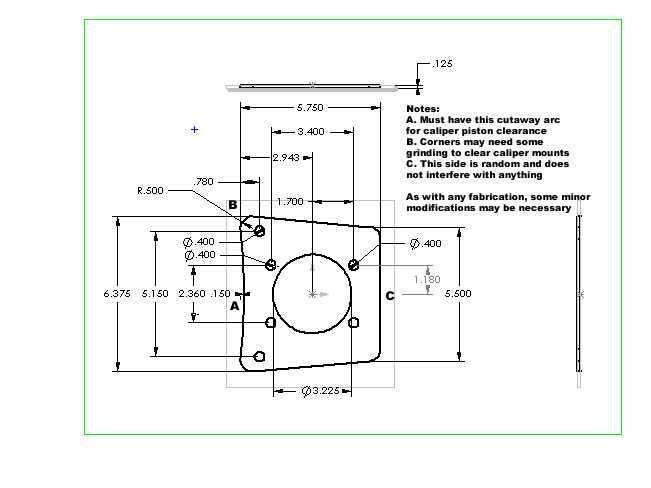 Below is the drawing of the adapter bracket, to adapt the 280Z rear rotor's to the 240Z, along with some measurments, hope this doesnt confuse anyone. The plate goes the same direction on both sides. the calipers mount toward the front of the car. I cut the drawing out, laid it on some steel plate and cut it out with a torch. Then used a grinder and a dremel tool to smooth out the rough edges. I used a old rear strut on the bench for final fit before installing on the car. I do recommend going to the salvage and picking up a set of used calipers because the mounting brackets will not come with the rebuilt calipers and will need to be removed from the used set. If you had to use the salvage set I suppose you could but the rebuilts didnt cost much. I bought the calipers, new rotors, brake hoses and semi-metallic pads at Oreilys for approx. 150.00. I used the stock pads for mockup and had Carbotech build me a set of racing pads. Porterfeild will do this also for a little less money I believe. Overall it's a simple job. I used a brake hose from a Suzuki Samuri and it fit perfect. Problem I did find while mounting mine was a lack of clearence between the braket and the caliper mounting . There were two ways to solve this. One is to shim the caliper out from the hub a small amount; the other is to cut the bracket and move the caliper mounting area to the back of the bracket. The simple way is to space the rotor out so I used washers for this spacing and everything bolted together without any other problems. The rotor still fit on the hub (barely though).